DHS students and staff participated in the annual Terry Fox run today. 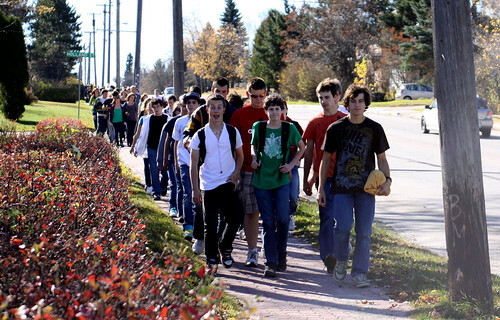 Dryden High School students and staff participated in the annual Terry Fox run today. Participants were treated to gorgeous fall weather as they walked, ran or rolled to support cancer research in honour of Canadian hero Terry Fox. After completing the run a barbeque with musical entertainment was held on the front steps of DHS. Thanks to all for participating and a special thanks to Mrs. Gardam and the DHS Leadership class for organizing the event.